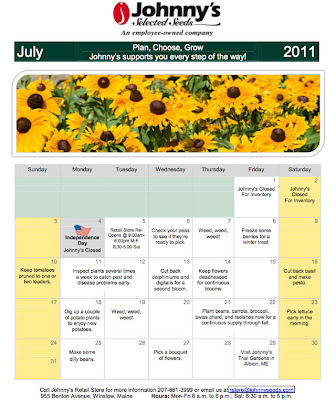 July is a busy time at Johnny's Research Farm. Crops need a lot of attention this time of the year when temperatures rise. Workers need to stay ahead of pests, keep fast-growing tomatoes trellised, and, of course, deal with weeds. Joe Lamonica, of Pittsburgh, PA, sent us this photo of his harvest of Jumbo green beans. This variety, a Johnny's exclusive, is an Italian flat-pod style, organic bush bean. A cross between Kentucky Wonder and Romano, Jumbo can grow pods up to 10" long with a rich bean flavor. "My dad used to grow these when we were kids," Joe said. "The seeds I purchased from Johnny's came up within a few days at 100% germination! They are producing loads of big, beautiful Roman beans! The beans in the photo are just about actual size. Mama Mia!" 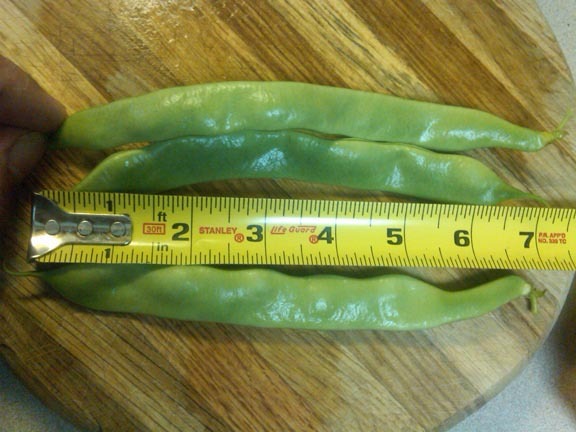 In a follow-up note, Joe said he recently harvested some 8" beans. Joe comes from a long line of gardening enthusiasts. "My grandfather and great uncle from Sicily built the first greenhouses in Fayette County, Pennsylvania," he said. There is still time to plant more flowers to add vibrant color to your fall market offerings. #1795G Antares Flashback calendula adds brilliant colors in shades of orange, peach, apricot, yellow, and cream with red and maroon undersides. Organically grown. #1815 Sunny Smile (F1) is a "miniature" pollenless sunflower with golden orange petals surround a black disc. Sunny Smile is good for containers. #1897 Little Becka (F1) is an unusual new brown dwarf sunflower. Little Becka is an early flowering full plant with large quantities of flowers. Extend your season into the fall with these essential herbs. #2576 Caribe cilantro/coriander is new and our recommended substitute for Calypso. Caribe has good bulk and is great for salsa and other tomato dishes. #529 Forest Green is our favorite, curled parsley. Its long upright stems allow for easy bunching. Forest Green has good flavor and appearance and is high yielding. Today, we look at our tomato trials and how we trellis the plants with twine. Also featured in this episode, the collinear hoe and pest and disease scouting. Add variety and uniqueness to your farmer's market offerings with chicory. Here are three great choices. #2811G Eros is an early escarole with dense heads of mildly bitter leaves good for salads or sauteing. Eros is an organically grown seed. #2614 Natacha is our prettiest and best performing escarole. It has large heads with abundant, tender leaves. Natacha has remarkable tolerance to bolting. It is an easy-to-grow choice and a Johnny's exclusive. #2555G Leonardo (F1) is a new radicchio with dense 4-5" heads. Its color and flavor are enhanced in cooler fall temperatures. Leonardo has high bolt tolerance. Organically grown. It's not too late to plant another round of cucumbers, especially in your hoophouse or greenhouse. Here is a new variety exclusive to Johnny's. #2562G Corinto (F1) is an easy-to-grow variety with good disease resistance and excellent flavor. It produces uniform 7-8" very dark green slicing cucumbers despite cool weather or heat. Gynoecious and parthenocarpic for greenhouse production. Organically grown. #2824G Nectar(F1) is a flavorful carrot with a straight and uniform 8" average root length. It is more resistant to alternaria and cercospora than Negovia. Organically grown. #2735 Hercules (F1) is an easy-to-grow carrot adaptable to difficult conditions like heavy or rocky soils. The cone shaped roots of Hercules average 6 1/2-7" long. Its strong tops hold up well in the field. #3820 YellowPak (F1) is a flavorful, all yellow imperator-type carrot. It is very uniform and high yielding with average 7 1/2-8" long roots. Slideshow of recent visit to the Farmers Market in Portland, Maine. Commercial growers know that vegetable-growing success lies in growing and harvesting throughout three and even four seasons. In this issue of the JSS Advantage, we'll suggest proven techniques and appropriate tools to help you extend your season and increase your profits this fall and winter. In most of the United States, mid-summer is the time to schedule fall crops, including those you will harvest this fall and winter and those you will plant in fall for early spring harvest. The best crops for fall are those that are not only cold-tolerant, but also taste better when they mature in cooler weather. Those include: beets, broccoli, Brussels sprouts, cabbage, carrots, cauliflower, celery/celeriac, collards, chicories, fennel, greens, kale, kohlrabi, leeks, lettuce, onions, parsnips, peas, radish, rutabaga, spinach, Swiss chard, and turnips. The Fall Planting Calculator assumes that you are going to be planting outside with no frost protection, so most of the planting dates are going to be in mid-summer. However, if you plan to use frost protection such as row cover over your crops in the field, you can push back the planting date a week or two. If you will be planting in a hoophouse or low tunnel, you can plant 4-5 weeks after the recommended date. For the longest possible harvest, plant some fall crops outside and some in protected structures including hoophouses and low tunnels. For those who grow vegetables in mild winter climates, July through September is the best time to plant warm-weather vegetables including beans, cucumbers, eggplant, peppers, summer squash, and tomatoes. Herbs such as basil, cilantro, and dill are also good choices for fall production. Pumpkins and watermelons can be planted beginning in August in north Florida and into September further south. Johnny's has a full selection of varieties suitable for fall production in the South. To ensure availability, order early. July is a good time to start planning for season extension, whether that means buying a new hoophouse or replacing worn-out row cover and frost fabric. Here are some ideas that can help you make fall and winter as profitable and productive as summer. If you can provide shade and moisture, you can get many cool-weather crops started in the heat of summer. Beets, carrots, chard, lettuce, onions, radishes, and turnips will actually germinate at soil temperatures of 85-95F (30º-35ºC), though they prefer it about 10º cooler. Escarole, endive, kale and kohlrabi won't germinate above 80ºF (27ºC), and spinach won't germinate above 75ºF (24ºC). To lower soil temperature, consider erecting hoops covered with shade cloth. Johnny's sells a knitted shade cloth that provides good ventilation when held above crops on Quick Hoops™. Sizes are available to perfectly fit Quick Hoops™ low tunnels or high tunnels. Soil should be watered thoroughly after putting on the shade cloth and before planting to give the soil a few days to cool off. Fall crops need ample moisture to get them started in summer; use drip irrigation and turn it on every day to keep the top few inches of soil moist. Be prepared for unexpected frosts as the weather cools. Johnny's row covers are available in a number of weights and sizes to provide exactly the protection you need on fall crops. A wide piece of heavy row cover can be pulled over multiple beds quickly when a heavy frost threatens. Row covers also can be used on hoops to create a protected microclimate all fall. The Quick Hoops™ bender makes perfect hoops from locally available electrical conduit, and Snap Clamps make it easy to attach row cover or poly for tight, stable low tunnels. Hoop Loops are pre-formed wire hoops with loops that allow you to secure twine down the length of the bed. When covered with row cover, the hoops and twine create a mini-greenhouse that prevents the covering from abrading plants. In September, plant in the hoophouse. You have plenty of time to get one or more crops of beets, broccoli, cabbage, Chinese cabbage, endive and escarole, greens, kale and collards, kohlrabi, lettuce, radishes, spinach, and turnips. Plant growth will slow as the days get shorter, but the cooler weather of fall will keep crops healthy. Plant enough that you can harvest for many weeks. Carrots can be planted for harvest all winter, in a hoophouse or low tunnel. Carrots will grow to maturity in fall but can be left in the ground to harvest as needed and they will get sweeter and more flavorful from in-ground storage. Spinach will continue to grow most of the winter, so young leaves can be picked repeatedly. Plant a crop of overwintering spinach in low tunnels covered with row cover in fall and poly in winter. Seed spinach before the first frost and the plants will reach 3-4 inches in diameter before winter cold stops their growth. They will resume growth in late winter and be a month earlier than spring-sown spinach. If you are considering reinvesting in your farm this fall, Johnny's tools are a good place to put your money. They are made of the highest quality materials to be durable under constant commercial use. Field-tested and used on Johnny's research farm, they have been designed and redesigned to be the most comfortable, adaptable hand tools available anywhere. Eliot Coleman, the market farming expert, designed several tools sold exclusively by Johnny's, including the long-handled Wire Weeder for precision weeding in tight spaces with the least possible soil disturbance. Coleman also designed our Collinear Hoes, which have a thin, sharp blade that runs parallel to the soil surface, thus allowing the user to stand up straight, reducing back strain while weeding. Most of Johnny's hand tools are manufactured in Switzerland and assembled in the U.S. with oiled ash handles made in New England. These tools are backed by Johnny's 100% satisfaction, guarantee. In many cases, replacement parts and sharpeners are available for them. We've been battling Colorado Potato Beetles for much of the previous month. If you are not trying to keep them off your potatoes, you’re trying to keep them off of your eggplants and vice versa. Amazing how a relatively small insect can strip a seedling of its foliage in a matter of a day or two. By the time a “herd” of potato beetle larvae make themselves across a seedling, you're most often left with stems and ragged little shreds of foliage, all of which will be delightfully coated in the excrement from the Colorado potato beetle adults and larvae. Adult Colorado Potato beetles, about 3/8” long, emerge from overwintering near previously infected crop plantings. The adults have alternating yellow and black stripes that run along its back. The larvae stage, are orange-red with a dark head and some spotting. 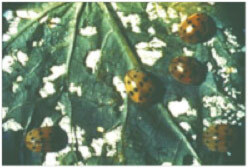 After feeding for several weeks, females lay masses of yellow-orange eggs on undersides of leaves. Females are known to lay close to a 1,000 eggs in their short life span of several months. Eggs hatch in four to nine days and the larvae can feed for two to three weeks, they then pupate in soil. The adults will then emerge in five to ten days, most areas will see two generations. There can be three in southern states. 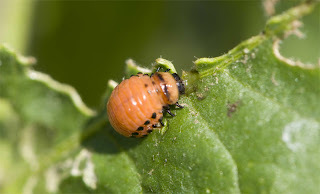 Potato, eggplant, nicotiana, petunia and certain nightshade weeds are preferred foods of the Colorado potato beetle adult and larvae. 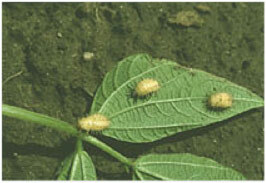 Adult Colorado potato beetle and larvae chew on the foliage of host plants. Damage typical of the adults is notching wounds along the leaf margins. The larvae however can cause the most damage to seedlings, leaving much more ragged injuries, resulting in devastating foliage loss. Foliage may also be soiled with excrement. When large outbreaks occur entire plantings may be stripped of foliage. There are many controls available to home gardeners and commercial growers to help combat this nuisance pest. Small scale home gardeners can venture out to the garden early in the morning and shake adults onto a drop cloth, then dropping collected beetles in a bucket of soapy water. Hand picking of both the adults and larvae is another option for home gardeners. Scouting on the underside of foliage for Colorado potato beetle eggs and destroying them by squishing them is another option. Mulching plants with at least four inches of straw (to discourage larvae from pupating in the soil) and floating row covers until harvest or mid season can be very effective methods of control. On a larger scale, releases of five spined soldier bugs can be an effective, non-spray approach, as well as releasing parasitic nematodes in the soil to attack larvae. When cultural and biological controls have not solved the problem, organic controls such as Entrust (Spinosad) applied via backpack sprayer or tank sprayer to foliage of potato plants or the foliage of other damaged crops. This should be applied as soon as you see Colorado potato beetle adults or larvae. Correct timing of applications and appropriate application rate is particularly important to maintain when using Entrust, so as not to develop resistance to Spinosad. Waiting until the infestation is severe will result in heavy loses, repeat spray as necessary to maintain control. 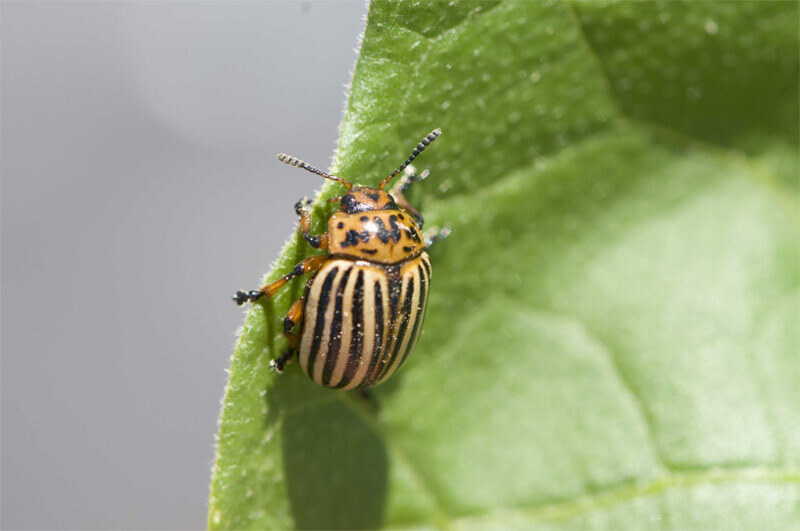 At last resort introducing Pyganic into your spray program for these crops can be effective in maintain population control of the Colorado Potato Beetle. When applying any pesticide be sure to read labels thoroughly and follow mixing and spray instructions specific to infestation. Always wear personal protective equipment as stated in label instructions. Download print-friendly .pdf version of the calendar. The end of June and the end of planting is well within grasp. The bulk of the planting and transplanting is done; the last big direct seeded crop, fall carrots, were planted yesterday. Cultivation is taking center stage now as we have a limited amount of time to kill the weeds before they become too big to handle mechanically. Weeds are funny this year as many seem to be way ahead of schedule. I saw Galinsoga the other day in full bloom; we usually don’t see that blooming until mid July anyways. And speaking of pests, I saw Mexican bean Beetles skeletonizing the bean leaves this week; that’s way early for them. It pays to actively scout a couple of days a week to keep abreast of looming pest issues. Colorado Potato beetles are out in force. Spinosad is a good control for them. They can quickly devour potato crops in what seems like no time at all; the eggs hatch quicker as the temperatures heat up. Below 65˚F eggs should hatch in about two weeks, but once the temps warm up to say 80˚F, eggs can hatch in as little as four days. So, if you see adults or eggs, the instars will be out and feeding before you know it. There are a few controls for Colorado Potato beetles; the best are row covers and Spinosad (Entrust and/or Monterey Garden Insect Spray). I think the nicest potatoes we ever had here were grown under AG-15 lightweight row covers. Of course there are a few drawbacks using row covers, namely weed control underneath them. We use lots of them here and every once in awhile something gets past us. Weeds running rampant under the covers is easy to miss as you can’t easily see what’s happening under the covers so once you pull the covers off you might see only weeds and not any crop. With proper management and frequent crop scouting, this happens infrequently throughout the season. Any contact pesticide like Pyganic will work on both stages of these critters. Bean beetles overwinter in bean vines and leaf matter so cleaning these up at the end of the season will help stave them off in the following year. Cabbage loopers are out and Dipel products will control them as well as other caterpillars. Loopers as opposed to cabbage worms look more like inch worms than regular caterpillars. As with all insect pests there are sprays which will take care of the problem, or there are cultural controls which eliminate spraying and perhaps killing non target species and good insects. Cultural controls include row covers, crop rotations and hand picking; everyone’s favorite job. We use row covers for crop protection and insect exclusion for many crops including cucurbits, brassicas and eggplant. Exclusion of insects offers the ultimate control and will result in the cleanest crops available. Once installed they cut down on the scouting intervals of the covered crops as no insects can get into the crop. Crop rotations will help control populations by denying food for the insects. For example, say a field has squash on it for three or four years in a row, then the populations of squash bugs and cucumber beetles will get built up. Take those squash away for a year and that insect population will move or starve as they have nothing to eat. Rotation also breaks disease cycles as well as insect population increases. Some insects are bound to survive, and others will migrate into fields that have a crop to eat, but not all will survive. And with rotation, insects can’t build up a resistance to it like they can with pesticides. And finally there’s hand picking – probably not everyone’s idea of a fun morning but not the worst job on the farm I can think of either. We use hand picking for control of adult Colorado Potato beetles when we trellis and prune our tomatoes. The beetles are often found this time of year mating, and can be dropped into a can of slightly soapy water or can simply be crushed. Crushing is usually done by one of two methods – placed between two rocks or between the thumb and index finger; your choice. One is faster but your fingers get all yellow.